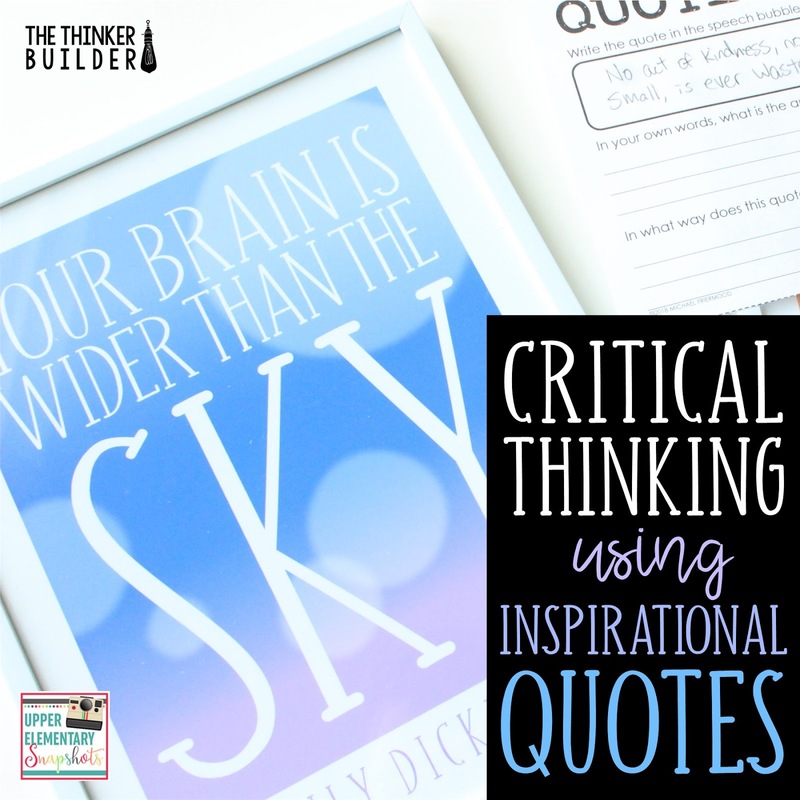 Inspirational quotes are, well, inspirational! We teachers love displaying our favorite quotes in our classrooms. 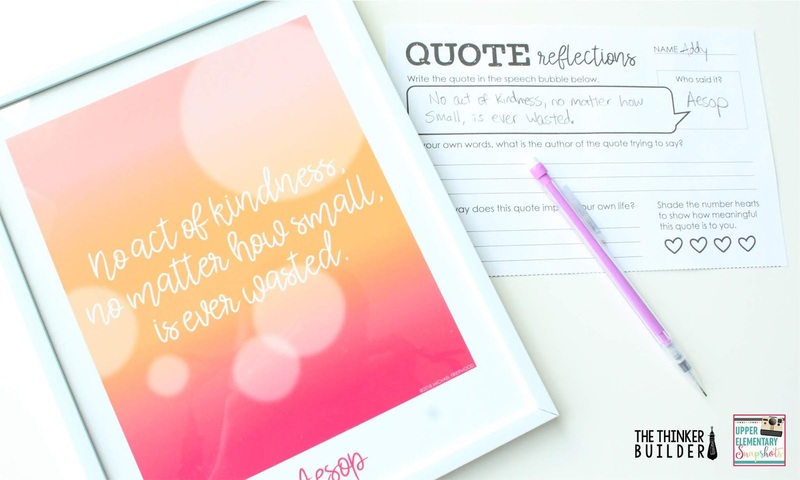 A good quote packs a big punch of meaning in a nice little (hangable) package. Whoa, that's a lot to do with a single sentence. But that's also a ton of thinking involved! 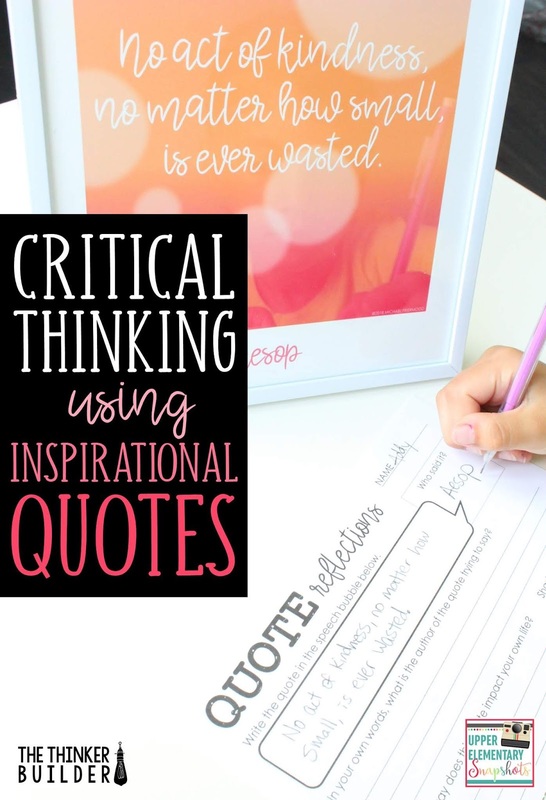 Digging into a quote with class discussion is a meaningful way to start a morning, or to start a week, or to wrap up a week. It also sets up perfectly for a written response task for students, either as a post-discussion assignment or by itself. "I am only one, but I am one." I love this quote. I love how completely simple it is: it has only eight words, and the longest word is 'only' four letters! 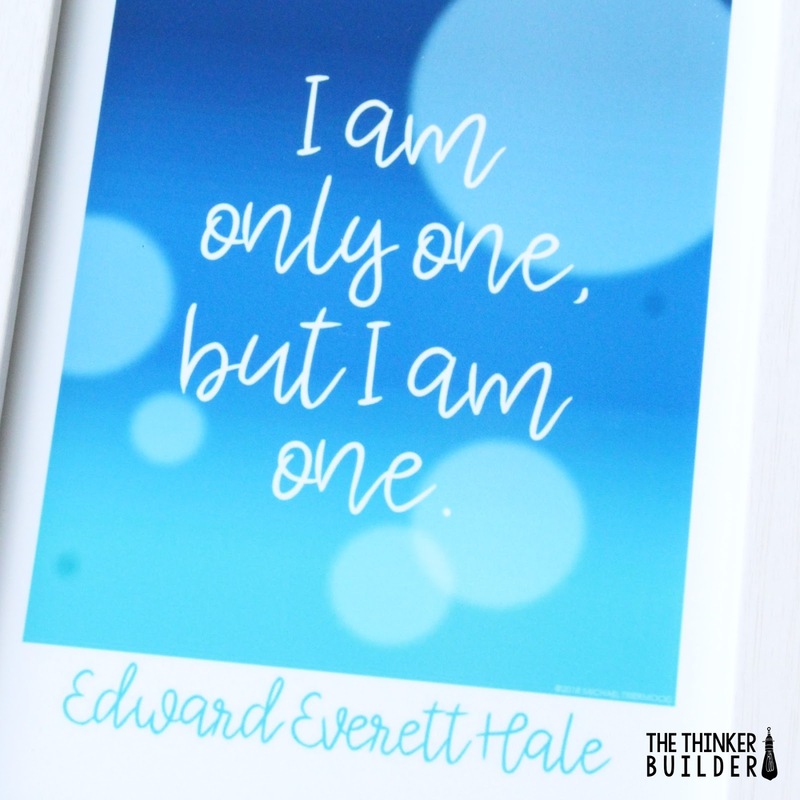 And I love the transcendent nature of it: it was made by Edward Everett Hale, an American writer from the 1800s, but it applies just as easily to the children in our classrooms, touching on the difference one person can make in this world. First, students record the exact quote and the author of the quote. Second, in their own words, students tell what they think the author of the quote was trying to say. What did they mean with these words? What did they want you to know? Third, students think about how the quote relates to their own life. How does this impact you? How are you affected by these words? Last, I like to have students give a rating, on a scale of one to four hearts, showing how personally meaningful the quote is to the student. Especially if they respond to quotes on a consistent basis, this allows them to quickly refer to which quotes they particularly like and want to remember. 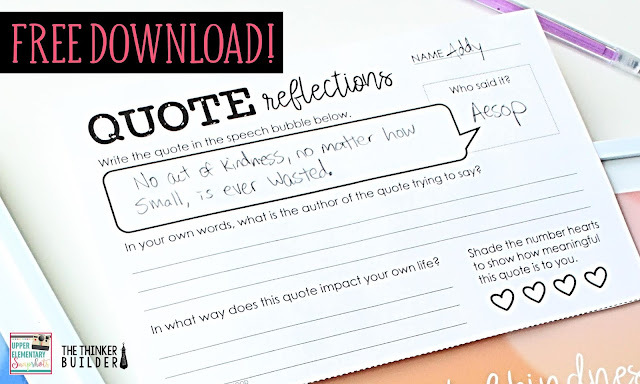 I've taken the progression of questions above and made a handy "Quote Reflections" half-sheet printable to help organize students' responses. You can download the form, totally free, right HERE. 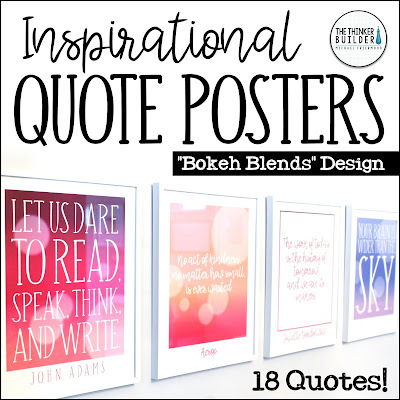 And if you're interested in the quote posters shown in throughout this post, they are part of my pack of 18 inspirational quotes from my TeachersPayTeachers store. Get details HERE or click the image below. 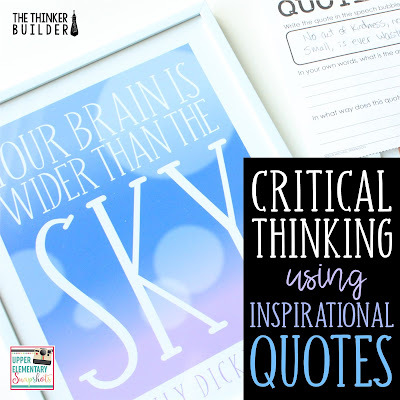 Whatever quotes you use, whether they be framed and hung or simply written on your whiteboard, dig into them with your students to bring out the critical thinking that lies within. 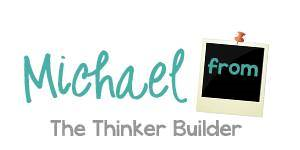 Come visit me on my blog, The Thinker Builder, or on Facebook, Instagram, or Pinterest!